In her role as an oral health therapist at Ranford Road Dental Centre, Kristie is passionate about the positive impact she is able to have on patients. Whether it’s through treatment or education, she is able to alleviate pain, restore oral health, improve confidence and provide patients with the tools they need to maintain optimal oral health well into the future. 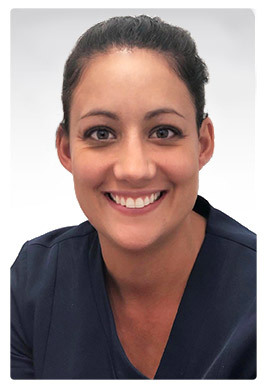 Kristie chose to become an oral health therapist as she has always had a keen interest in the human body and the medical field. Upon graduating high school in 1998, she completed a Certificate IV in Dental Nursing in 2000 and was named the top clinical student. In 2003, Kristie earned an Associate of Science in Dental Therapy, again graduating as the top clinical student. She also obtained an Associate of Science in Dental Hygiene in 2008, and a Bachelor of Science in Oral Health Therapy in 2013. The highlight of Kristie’s career in dentistry was spending three years working in Remote Western Australia from 2004 to 2006 (inclusive). During that time, she travelled constantly servicing towns from Carnarvon, through the Central Wheatbelt, down to Pemberton and everything in between. When she’s not at the practice helping to improve patients’ oral health, Kristie enjoys spending time on her hobby farm with her husband and their three young boys. She also likes to get together with friends and family and enjoy delicious food and good coffee. Call or email our Canning Vale practice today to make an appointment with Kristie! Saturday appointments are available for your convenience. We are participating providers for many health funds including CBHS, HCF, HBF, Medibank Private and nib.